One of my favorite stores is T.J. Maxx. And yes, it really is a “new store everyday!” You have to be a certain kind of shopper to enjoy a store like T.J.’s, or T.K.’s as it is known in Europe. The Maxx is not for shoppers on a mission or those, like the boyfriend, who like to go in, get it and get out. On one trip into the Maxx, he lamented, “It’s like you’re just looking for things to buy.” Exaaaactly! You don’t really go into T.J.’s to buy, say, a specific item like a navy pair of shoes. You go in and see what clever footwear just happens to be in your size and for a great price. You feel so lucky when you find that perfect pair of shoes that you didn’t know you needed just a few minutes before. On a trip to London, I was surprised to find the Maxx logo with a T.K. prefix. T.J.’s is T.K.’s in Europe so as not to be confused with the existing discount chain, TJ Hughes. In addition to a veritable shoe buffet, T.J.’s features an abundance of body products such as soaps and lotions, scrubs and balms, hand washes and perfumes, as well as shower gels and shampoos. And, there are always lots of wonderful scents to choose from–Banana Vanilla and Cherry Almond, for example. Citrus scents abound as well: Sumatra, grapefruit, lime, lemon, tangerine, kumquat, and more. In just a few minutes, I gather up these examples to show how easy it is to find items that stand out on their own or look great bundled together for a gift. While always a better deal at stores like Marshalls, Tuesday Morning, T.K. or T.J. Maxx, some products, or close similes thereof, are available online. And, when it comes to facial products, be sure to check expiration dates. 2. Squeeze Eau de Parfum by Lilly Pulitzer. Fragrance Notes: pink grapefruit, lychee, lotus blossom, sun-drenched woods, water musk red currant, wild rose. 3. Lemongrass appears to be a favorite when is comes to hand soaps and T. J. carries several varieties. Perhaps that is because the essential oils from the leaves of this grassy herb have an intense citrus aroma. Lemon grass is also used to treat fungal infections and repel insects. It’s interesting to note that the culinary influence of lemongrass shows up in how it is paired with other ingredients such as these lemongrass hand soap: Burt’s Bees with green tea, Kiss My Face with Clary sage, and the organic Nature’s Gate with Clary sage as well. Good enough to eat. 4. Lather up with this moisturizing Orange Jelly Bean Shower Gel and Bubble Bath from Philosophy. Perfect for Easter baskets, too! The Maxx has a great selection of Philosophy products year round. 5. Finds like this Bon Chic Seda France Orange Sumatra Flower candle are one of a kind’s from season’s past. Visit Seda France for new luxury candle fragrances in citrus scents such as Italian Bergamot…or keep a look out for your own last season’s find and score a deal on this luxury brand. 6. I love reed scent diffusers to gently fragrance the home and T.J.’s always has a great variety to choose from, especially around the holidays. Trinity Candle Factory is a nice online source for diffuser kits and they feature a long list of scents, including kumquat. Kumquat, Chinese for “golden orange,” is exceptionally sweet and fragrant. Although primarily sought after for their fruit, kumquat leaves and twigs provide oil prized for perfumery and aromatherapy. 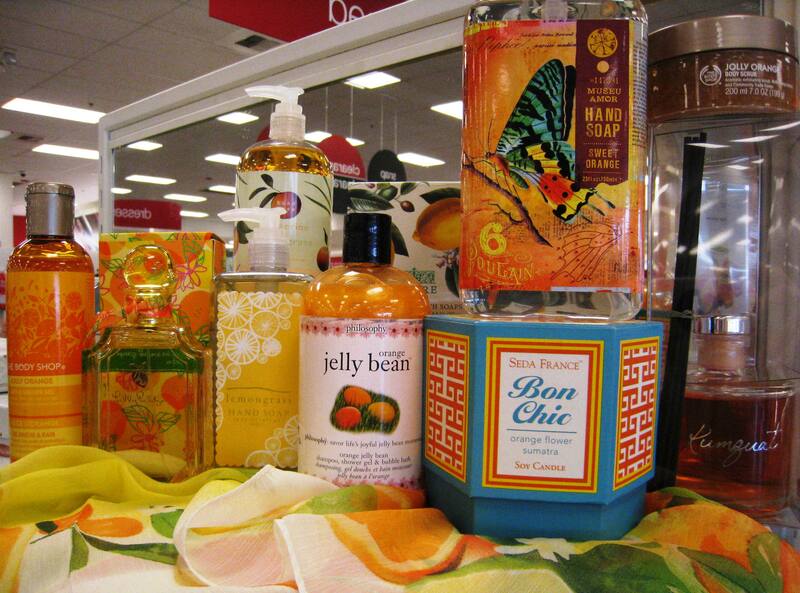 Other citrus scents include Florida Orange and Lemon chiffon. Handily, they have reed diffuser oil refills for order as well. Another online source for diffusers is Archipelago Botanicals with scents such as Bergamot Tobacco, Mango Tangerine, Grapefruit, Pomegranate Citrus and Verbena Basil. 1 A blend of Tangerine and Lemongrass scents this hand soap. 2. Oh, I wish I hadn’t left this little box of delectable Lavare lemon poppy seed bath soap squares behind. Lavare products are always nicely packaged and feature botanical prints. Great for gifts and stocking stuffers. 3. A whimsical label. Hand soap in sweet orange. 4. And back to the Body Shop’s Jolly Orange line, this time in a body scrub. 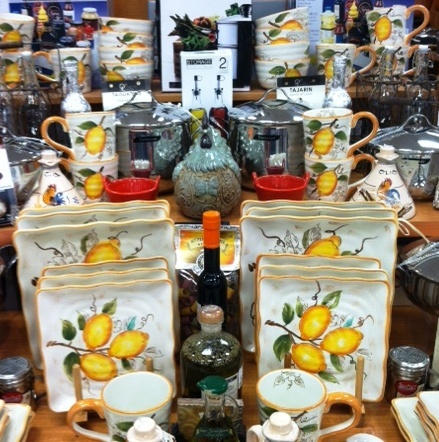 Expand your search to linens and dinnerware as well. On this outing, T.J.’s also features rustic lemon themed dinnerware, “Lemon Sketch” by Maxcera. So go on…take a stroll up and down the aisles until you find a treasure that you didn’t know you needed. Your home will look and smell all the sweeter for it.